Recumbents by National Bicycle Greenway : Fossil Fool's Double Decker "Tandem" Recumbent!! Fossil Fool's Double Decker "Tandem" Recumbent!! Paul Freedman (also known as Fossil Fool, the Bike Rapper) began Rock the Bike in Summer of 2004. The company was initially called "Fossil Fool", but that name now refers only to his bike rapping alter ego. 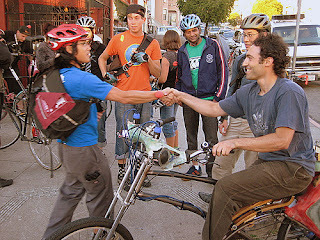 In addition to sending out the bike vibe through his rap, custom Soul Cycle party bikes, and the Down Low Glow bike lights, Paul also contributes to Worldbike.org, a nonprofit developing low cost cargo bikes for poor countries. Previous to dedicating himself as a bike culture artist, musician, and social entrepreneur, Paul worked at Metazoa, a scientific software company making collaboration tools for research biologists. Paul graduated from Harvard with a degree in Computer Science. He hardly uses his formal education, except to communicate with coder Brandon Bergren. When it comes to product design, engineering, business, marketing, etc., he is self-taught.